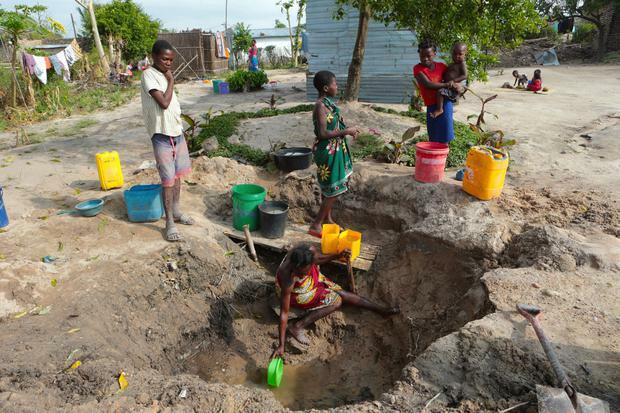 Mozambique has confirmed more than 3,100 cases of cholera since the outbreak was declared in the wake of Cyclone Idai. Six people have died in the past two weeks after the floods left tens of thousands of people stranded in camps with few toilets and little clean water. Health workers are battling to carry out a mass vaccination in the storm-hit city of Beira following a delivery of nearly 900,000 doses last week. It has been described as "the most ambitious campaign ever conducted using the one-dose oral cholera vaccine strategy" by the humanitarian organisation Doctors Without Borders. The UN specialist co-ordinating the relief effort, Julien Graveleau, said he was "quite optimistic" of success. "Of course, the numbers will be increasing but I believe we're ready for it," he added. Mozambique's health ministry said more than 70pc of the vaccines had been administered by Sunday morning, partly thanks to megaphone-wielding promoters handing out doses. At Beira's popular Shoprite grocery, people knocked back the doses like shots in a bar and walked on. "We were prepared really for the worst," said Francisca Baptista da Silva, a project coordinator for Doctors Without Borders. "But for the moment we are controlling it." Outside one cholera treatment centre in the Beira neighbourhood of Pioneros, a woman sold bottled water while passers-by stepped around fetid pools of water in the street. Treatment for cholera can involve simple rehydration but the disease can kill within hours.